Selkirk bannocks are a sweeter variety, made with flour rather than oatmeal and more like bread in consistency. They were originally made by a Selkirk baker during the Christmas period, but over time have come to be associated with special occasions in general for many people. Traditionally round in shape, my first attempt at making it (pictured, right) used a normal loaf tin since that’s what I had to hand. I didn’t have any lard so used all butter, and this didn’t seem to be a problem. 1. Mix together the flour, sugar and yeast in a large bowl. 3. Make a well in the middle of the dry ingredients and pour the milk, butter and lard into it, then work the ingredients into a smooth dough. 4. Cover the bowl with a warm, damp towel and leave in a warm place for about an hour, or until the dough has doubled in size. 5. Knead the dough well for five minutes (you can dust your hands with a little flour to prevent sticking. 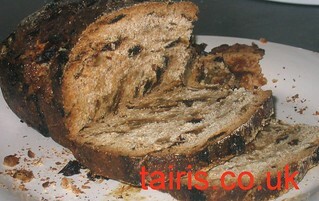 Then work in the sultanas and mixed peel and knead again for another five minutes. If you want, you can mold the top of the dough into three or nine knobs, as was traditional in some parts of Scotland, or else dispense with the tin and place on a baking tray in a particular shape (round, as was usual, or triangular, for example). Then cover with a warm, damp towel again (if using a tin), and leave in a warm place to allow the dough to rise again, for about half an hour or so. 7. Cook for an hour at 180ºC (adjusting for fan ovens), then carefully remove from the oven and apply the glaze. Return to the oven for another 20 minutes or so, until the middle of the bannock is well cooked.